Acute frontal sinusitis (AFrS) is defined as an acute bacterial infection of the frontal sinus cavity. Among all of the paranasal sinuses, acute bacterial infections localized to the frontal sinus are most commonly associated with intracranial complications. Frontal sinus surgery is performed to prevent potentially life-threatening complications when the infection is unresponsive to maximal medical therapy. Mucociliary clearance in the frontal sinus occurs in a counterclockwise direction in the right sinus and in a clockwise direction in the left. Secretions are transported along the septal wall to the sinus roof and from there, laterally along the roof and then medially along the floor to reach the ostium. Secretions that are retained because of obstruction serve as a nidus and as growth media for infections. Given the close anatomic relationship of the ethmoid and frontal sinuses, obstruction of the ethmoid air cells often leads to AFrS. This obstruction may be caused by nasal polyps, tumor, severe septal deviation, trauma, chronic mucosal inflammation, or acute infection. Obstruction impedes the drainage of the frontal and ethmoid sinuses via the frontal recess and impairs mucociliary function. In addition, there are a number of anatomic variants that lead to obstruction of the nasofrontal outflow tract. These include large concha bullosa, a laterally rotated uncinate process that contacts the middle turbinate, and, conversely, a medially convex middle turbinate that contacts the lateral nasal wall. Previous middle turbinate resection can also lead to stenosis of the frontal sinus ostium secondary to soft-tissue scarring or residual bony fragments. Patients with AFrS often present with dull or pressure-like pain localized to the frontal, supraorbital, or interorbital regions. When this symptom is accompanied by nasal congestion, maxillary pain or pressure, and mucopurulent nasal drainage, the frontal sinus is not likely to be involved in isolation. Isolated AFrS is an important clinical entity, as it suggests a more pernicious type of obstruction of the frontal sinus drainage pathway and may be more liable to result in intracranial or orbital complications. The complications of AFrS may be classified as either intracranial or orbital. The true incidence of complications stemming from AFrS is not known. Meningitis, brain abscess, epidural empyema, subdural empyema, cerebral empyema, and dural sinus thrombosis are known intracranial complications of AFrS. 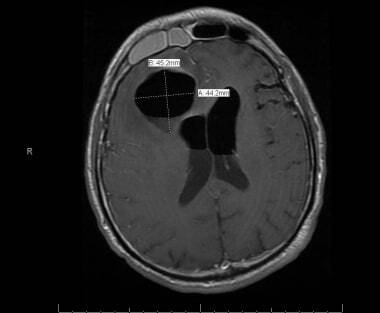 Axial MRI image of a patient with acute frontal sinusitis complicated by large right frontal lobe abscess. (A) A patient suffering from a Pott puffy tumor that had degenerated into a sinocutaneous fistula. (B) A closer view. The frontal sinus ostium can be seen. Trephination of the frontal sinus has been performed since prehistoric times, either by scraping or incision. Two Peruvian skulls at the Museum of Man, in San Diego, show trephines, with evidence of patient survival. In addition, early surgeries were described in which part of the anterior frontal sinus wall was removed, leaving the patient with a significant cosmetic deformity. More refined surgery of the frontal sinus was first described in the 19th century, and options for treatment have expanded since the advent of endoscopic sinus surgery. Despite the long history of AFrS surgery, much remains to be elucidated about its long-term outcomes, as well as about postoperative care and follow-up. The frontal sinus develops from small grooves in the cartilage of the lateral nasal wall near the middle meatus during the third and fourth fetal month. It forms an outgrowth from the area of the nasofrontal recess. The frontal recess itself is a space within the anterior ethmoid sinuses, bordered by the agger nasi (the most anterior ethmoid cell) anteriorly and the ethmoidal bulla cells posteriorly between the middle turbinate and lamina papyracea. It may be indistinguishable from the anterior ethmoid cells. The images below show the frontal sinus in relation to other structures. (A) Frontal sinus, (B) middle turbinate, (C) ethmoid bulla, (D) hiatus semilunaris, (E) uncinate process, and (F) superior turbinate. 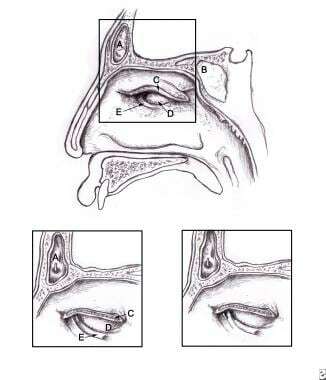 Axial section through right nasal cavity depicts the following: (A) middle turbinate (or concha); (B) ethmoid bulla; (C) drainage sites for frontal sinus (3 shaded areas); (D) uncinate process; (E) nasolacrimal duct; (F) hiatus semilunaris; (G) basal lamella; (H) septal cartilage. (A) Frontal sinus, (B) sphenoid sinus, (C) cut surface of the middle turbinate, (D) ethmoid bulla, and (E) hiatus semilunaris. The frontal sinus opens into the anterior part of the middle meatus (the frontal recess) or directly into the anterior end of the infundibulum. This relationship to the infundibulum and middle meatus serves to protect the frontal sinus from the spread of disease in the ostiomeatal complex. The frontal recess relates medially to the lateral lamella of the cribriform and the cribriform plate. During endoscopic sinus surgery, this area is at higher risk for iatrogenic cerebrospinal fluid (CSF) leak. There are also two patterns to the frontal sinus outflow tract: some persons drain medial to the uncinate process and some drain lateral to the uncinate process. The frontal sinus drainage pathway is demarcated medially by the orbit and posteriorly by the skull base and bulla ethmoidalis. The mucociliary clearance of the frontal sinus is an active process that involves the inward transport of mucus, which starts laterally and forms a whorl-like pattern. The frontal sinus is incompletely developed at birth and is first visible radiographically in patients aged 6 years. The sinus enlarges vertically in older adolescents to reach its adult volume of 4-7 cm3. Pneumatization of the frontal sinus extends into the squamous part of the frontal bone and posteriorly into the orbital part of the frontal bone to form a supraorbital cell. The inner plate of the frontal sinus is compact bone, while the outer plate is cancellous bone. The ethmoid sinus itself can pneumatize into the orbital plate of the frontal bone posterior to the frontal sinus. This supraorbital cell usually opens more posteriorly and laterally, as compared with the frontal sinus. The supraorbital and supratrochlear arteries, which branch off the ophthalmic artery, form the arterial supply of the frontal sinus. The superior ophthalmic vein provides venous drainage, and the supraorbital and supratrochlear branches of the trigeminal nerve supply innervation. The dura mater actually provides the venous drainage for the inner table, the periorbita for the orbital plate, and the cranial periosteum for the outer table. This is in addition to the diploic veins and all venous structures that communicate in the venous plexuses of the inner table, periorbita, and cranial periosteum. Surgical treatment for AFrS is undertaken when the infection fails to respond to maximal medical therapy, which is defined as the use of intravenous antibiotics and mucolytic agents along with topical and systemic decongestants for 3-5 days. Other important indications for surgery include the presence of an orbital or intracranial complication and the development of recurrent AFrS, defined as AFrS that recurs at least 3-4 times per year. A diagnosis of invasive fungal sinusitis is also an indication to proceed with surgery. In the pediatric population, the indications for operative management of AFrS are similar to those in adults. However, AFrS is less frequently seen in children, due to their underdeveloped frontal sinuses. Contraindications to surgical management depend on the approach used. The primary contraindication to trephination is the presence of an aplastic frontal sinus. Relative contraindications to external approaches include a history of keloid development and previous failure of an external approach. The presence of hypoplastic frontal sinuses obviates the need for osteoplastic flap procedures with frontal sinus obliteration. Computed tomography (CT) scanning is the imaging study of choice in acute frontal sinusitis, because it depicts optimal bony, soft tissue, and air detail in the setting of sinus disease. Triplanar CT images can be diagnostic and aid in preoperative preparation. Intravenous contrast enhancement should be considered if abscess formation is suspected. Imaging findings suggestive of AFrS include the presence of air-fluid levels and opacification of the frontal sinuses. 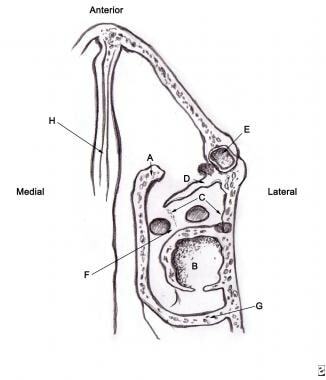 One-millimeter, nonenhanced, coronal sections are recommended because they best correlate with surgical approaches and because they demonstrate the ostiomeatal complex and channels and accurately depict the relationship of the brain to the fovea ethmoidalis and ethmoid sinus, as well as the relationship of the orbits to the sinuses. Over the past 20 years, endoscopic approaches to the frontal sinus have become the primary surgical modality for AFrS that is unresponsive to maximal medical therapy. Even for difficult lateral frontal sinus pathology, the endoscopic approach remains effective. The purpose of functional endoscopic sinus surgery (FESS) is to debride the sinuses of inflammatory tissue and bacteria and to promote mucociliary clearance by eliminating obstruction of outflow tracts, all while preserving normal sinus physiology and function as much as possible. Although endoscopic procedures for AFrS may be more technically difficult than open/external procedures, the endoscopic method provides a number of important advantages. Endoscopic approaches always achieve better cosmesis than external approaches, leaving no outwardly visible scars or deformities. In addition, lateral bony support for the sinus is preserved, so medial soft-tissue collapse does not occur. Moreover, the presence of disease in the other paranasal sinuses can be eradicated simultaneously. On occasion, opening the lower anterior ethmoid and agger nasi region may relieve frontal sinus outflow obstruction and obviate the need to surgically address the frontal recess. Use of balloon sinuplasty for AFrS has been described,  although the data supporting the effectiveness of this newer technology in the acute setting is extremely limited. Many external techniques for frontoethmoidectomy have been described, and these may be performed in isolation or in conjunction with endoscopic approaches. External frontoethmoidectomy can be used for the treatment of acute sinus disease with frontal extension, as in the case of mucoceles, pyoceles, and sinocutaneous fistulae, as well as for the treatment of various intracranial complications of frontal sinusitis. Trephination, an ancient procedure now modified, is used in the treatment of acute purulent frontal sinusitis, sinusitis refractory to conservative management, and intracranial and orbital complications of frontal sinusitis. In children, loss of the afferent pupillary reflex is an important sign of orbital complications. Under local anesthesia, a small incision (usually 1 cm long) is made below the medial eyebrow and supraorbital rim down through the periosteum. The periosteum is then elevated. A drill or chisel helps in gaining access to the anterior table of the sinus. Purulent drainage is then evacuated, and catheters are inserted for postoperative irrigation and drainage. The skin is closed around the catheter, and the catheter is secured to the adjacent skin with suture. 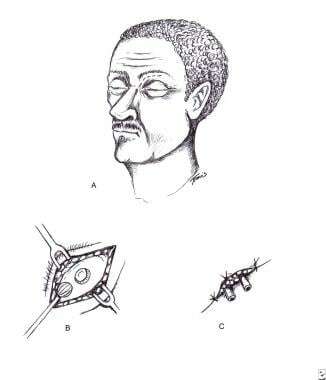 The image below depicts the surgical procedure. (A) Curved incision under eyebrow to periosteum, (B) underlying bone exposed by periosteal elevator, with burr holes created with small drill, (C) two small plastic tubes inserted for daily irrigation of the frontal sinus. Four-millimeter 0° and 30° scopes may be used upon entering the sinus to identify the nasofrontal duct. This procedure can be performed in combination with endoscopic sinus surgery. The intersinus septum is removed when the frontal sinusitis is unilateral, to provide drainage through the contralateral frontal sinus recess. Saline solution containing broad spectrum antibiotics is used to irrigate the sinus. Irrigation is performed for 7-10 days (no longer than 14 d) to help restore the function of the outflow tract. The catheters can be removed when adequate drainage is achieved through the nose via the frontal recess. Failure to respond to this procedure may suggest residual disease or obstruction localized to the ostiomeatal complex or anterior ethmoids. The Lynch approach involves a curvilinear or gull-wing incision above the caudal margin of the lateral nasal bone halfway between the nasal dorsum and medial canthus. The trochlea and medial canthal ligament must be avoided. The incision is made through the periosteum, and the periosteum is then elevated off the lacrimal fossa, lamina papyracea, and floor of the frontal sinus. The anterior ethmoidal artery, seen in the frontoethmoidal suture line, can be clipped or cauterized. The frontal sinus is then opened medially with a burr or chisel, and the medial floor is removed until the area of acute infection is identified. The modified Lynch procedure preserves as much of the normal mucosa as possible, as well as the middle turbinate and frontal process of the superior maxilla. Mucosa should be preserved, especially in the frontal recess to prevent stenosis. The frontal recess may be opened with a stent or rolled silicone for several weeks to further impede stenosis. The advantage of the Lynch approach is that it is technically simple, and as such, it can be performed rapidly, especially in elderly patients or in those with high medical risks. This procedure causes some disfigurement, most notably when the supraorbital rim is removed. The risks of recurrence and of mucocele and mucopyocele formation are higher than in other procedures. The Lynch approach is suboptimal for widely pneumatized sinuses or for lateral pathology, as removing the mucosa and eradicating all disease is difficult with this technique. The Lothrop, or Chaput-Meyer, technique is used mainly for chronic, bilateral frontal sinusitis, but modifications are used in the treatment of acute infection. 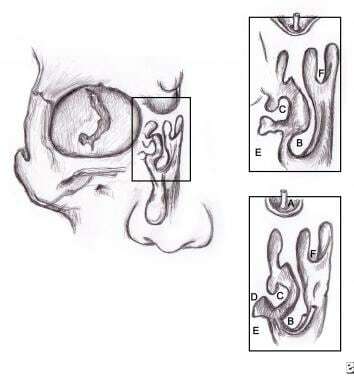 The external technique involves resection of the intersinus septum, superior nasal septum, and medial frontal sinus floor, connecting the two outflow tracts and thereby creating a large frontonasal communication. Drainage via the healthy side of the sinus can be used to treat unilateral frontal sinus disease. This operation is more effective than others in eradicating persistent frontal sinus disease, although it can be used in treating AFrS. One of the disadvantages of this procedure is that it causes medial collapse of the orbital soft tissues, which may result in stenosis of the nasofrontal communication. Also, the procedure is technically difficult, and the cribriform plate is directly posterior to the dissection, increasing the risk of intracranial injury. The osteoplastic flap is typically reserved for chronic cases of refractory frontal sinusitis or for those accompanied by intracranial complications. Conservative medical management and/or surgical drainage procedures must be performed prior to the consideration of obliteration. The presence of hypoplastic frontal sinuses is a contraindication to the obliteration procedure. The particular advantages of the osteoplastic flap procedure are the excellent visualization of the sinus, an ability to correct problems of the posterior table and dura, the elimination of the need to establish a frontonasal communication, and an overall low failure rate. A drawback to the procedure is difficulty in postoperative follow-up, as the sinus is obliterated. Nonetheless, the osteoplastic flap procedure remains the criterion standard in chronic refractory or recurrent acute frontal sinusitis when extended endoscopic approaches have repeatedly failed. Current modifications include the use of a pericranial flap and cancellous bone grafts. The coronal incision is useful and cosmetically acceptable if the patient is not balding, but it involves more blood loss. The midline forehead incision is incorporated into a patient's forehead wrinkles, if present. The brow incision is the least cosmetically acceptable and may cause postoperative pain, anesthesia, or paresthesias. Mapping of the frontal sinus, generally using image guidance technology, allows the surgeon to safely outline the border of the frontal sinus. Ipsilateral tarsorrhaphy also should be performed to protect the globe. After one of the three approaches is used, the frontal periosteum is cleaned of subcutaneous tissues. Image guidance aids in outlining the frontal sinus. The periosteum is then incised 5 mm above the outline of the sinus and elevated to just below the frontal sinus outline. A power saw is used to cut into the frontal sinus by beveling the saw blade downward and inward. Utilization of image guidance helps to ensure that the bone cuts are in the frontal sinus and do not enter the anterior cranial fossa. Small cuts above the glabella may be necessary to weaken the frontonasal suture. The osteoplastic flap is then fractured forward from above, but only after fracturing the intersinus septum with an osteotome or elevator. The bone flap can now be raised, fully exposing the frontal sinus and allowing for evacuation of purulent contents. The sinus mucosa must then be completely stripped, as failure to do so may result in future mucocele formation. This is often achieved with the use of a polishing burr. If the posterior table of the frontal sinus has osteomyelitic involvement or is absent because of an expanding frontal sinus mucocele, it can be removed, allowing the dura to move forward to occupy the frontal sinus space (ie, cranialization of the frontal sinus). After complete mucosal denudation, the frontal sinus can be packed with fat or other materials before the bone flap is replaced. A variety of substances can be used, including Gelfoam, Teflon, fat, paraffin, silastic sponge, or cartilage. Autogenous fat, typically harvested from subcutaneous abdominal adipose tissue, is currently the preferred substance for obliteration, because it is thought to prevent osteoneogenesis and impede regrowth of the mucoperiosteum. In addition, the fat revascularizes and, thus, is theoretically more resistant to postoperative infection than other substances. Donor site morbidity is the chief drawback of autogenous fat use. After packing, the bone flap is replaced and secured with plating. The incision is then closed in layers. A suction drain is generally used to prevent hematoma formation, to be removed 24 hours postoperatively. Use of a compression dressing is recommended. Endoscopic sinus surgery for AFrS is performed under general anesthesia. Local anesthetic is injected in the agger nasi region and vertical lamellae of the middle turbinate. Pledgets soaked in either Neo-Synephrine or 1:100,000 thrombin with epinephrine are placed intranasally for approximately 5-10 minutes. The patient is positioned with 20-30° elevation and gentle extension of the head. Nasal endoscopy is performed by using 0°, 30°, 45°, and 70° telescopes. An uncinectomy, anterior ethmoidectomy, complete frontoethmoidectomy, and resection of the agger nasi and anterosuperior attachment of the middle turbinate are necessary to create a widely patent frontal recess. An ostium probe or ball-tip seeker may be used to locate the outflow tract. To remove the anterior nasofrontal beak, a shelflike bony process anterior to the frontal outflow tract, a variety of instruments may be used, including a Kerrison rongeur, a drill, and bony curettes. Further drainage may require removal of the superior aspect of the nasal septum, especially for a bilateral frontal sinus drill-out procedure. To allow for reepithelialization, the surgeon must not remove the posterior table mucosa. Mucosal preservation is of utmost importance in routine, uncomplicated frontal sinus surgery. A frontal sinus stent may be used in more complicated cases where mucosal preservation may be difficult and typically when the neo-ostium is less than 5 mm in diameter. FESS can also be used with trephination in the presence of thick septations, high frontal cells within the sinus, and lateralized frontal sinus disease. Extended drainage of the sinus can be achieved by means of resection of the frontal sinus floor. The modified Lothrop procedure helps to prevent nasofrontal duct stenosis due to medial collapse of orbital soft tissue by preserving the lateral bony wall. The frontal recess is cannulated in a unilateral fashion. A soft-tissue shaver can then be used to remove the perpendicular plate mucosa anterior to the frontal recess and the anterior aspect of the frontal recess bordered by the anterosuperior attachment of the middle turbinate. A wire probe is placed through the nasofrontal isthmus into the frontal sinus to assist in orientation. A bone-cutting drill is used to cut the bone of the anterior face of the frontal recess unilaterally. This area is the nasofrontal beak. The perpendicular plate is removed as far as the nasal floor of the sinus, while the surgeon stays well anterior to the wire probe. The drill then enters the floor anterior to the nasofrontal isthmus in the nasal crest, which is then removed. The contralateral frontal recess and isthmus are opened to communicate with the frontonasal opening. Bone is removed until a thin rim of bone exists around the frontonasal opening in the glabellar region. In frontal sinuplasty, an endoscope is used to place a 70° or 90° guiding cannula into the upper middle meatus, and the guide wire is passed through it into the frontal sinus. Image guidance can be used to identify the entrance to the frontal recess, which is medial against the middle turbinate and more posterior than expected. Light confirmation is also used to confirm position of the guide wire. If unsuccessful, the cannula may be repositioned as needed. Once confirmation of the distal end of the guide wire is confirmed via sinus transillumination, a balloon catheter is passed over the cannula into the frontal sinus and then inflated to dilate the frontal sinus recess. The balloon serves to fracture the surrounding bone, and as little as 6 atmospheres of pressure may be enough. It is important to keep pressure to the minimum necessary because of subsequent mucosal edema. For patients with lateral frontal sinus disease that has eroded into the orbit, FESS combined with a transblepharoplasty approach may be used. In this method, standard endoscopic techniques are used to perform ethmoidectomy and remove agger nasi and frontal recess cells while exposing the ethmoid skull base. The upper eyelid crease on the affected side is injected; an incision is placed in the skin fold above the tarsal plate at least 8 mm above the lid margin with care to prevent webbing by not extending too far medially. The lateral limit is rarely beyond the bony orbital rim. The orbital portion of the orbicularis oculi is located and the muscle is incised. Then a plane is developed between this muscle and the levator aponeurosis toward the orbital rim while keeping the orbital septum intact. The preseptal plane must be maintained to keep the levator intact, and then a periosteal incision is made anterior to the orbital septum at the superior orbital rim. A subperiosteal dissection is completed in all directions, with the medial limit defined by the supraorbital notch and neurovascular bundle and the lateral and posterior limits defined by the extent of frontal sinus pneumatization. The frontal sinus floor is directly accessible and the area of dehiscence (in case of mucocele) is easily identified and treated. The flap is redraped in place once the patency of the outflow tract is determined endoscopically. Postoperative care is similar to that following any endoscopic endonasal procedure. In-office debridement of crusts, clots, and granulation tissue is necessary to prevent adhesion formation and is needed for the restoration of mucociliary clearance. Saline irrigation is needed to keep the surgical cavity moist and to inhibit crust formation. Patency of the frontal sinus outflow tract should be monitored endoscopically during the postoperative period. Complications of endoscopic sinus procedures are stratified into major and minor categories. Minor complications are epistaxis, orbital/periorbital ecchymoses and emphysema, dental pain, adhesions, hyposmia, and stenosis. Stenosis in the frontal recess occurs for three reasons: (1) overly aggressive dissection with stripping of the mucosa; (2) incomplete removal of the agger nasi and frontal cells, causing adhesions and scarring; and (3) excessive removal of the middle turbinate. Some major complications are similar to the complications of untreated or aggressive frontal sinusitis. These include meningitis and brain abscess. Others are a direct result of intraoperative trauma: CSF leaks, intraorbital hemorrhage, diplopia, blindness, epiphora, intracranial injury, stroke, tension pneumocephalus, significant epistaxis, and anosmia. Intraorbital hematoma, a surgical emergency, is a well-known complication of ethmoidectomy and often results from injury to the anterior ethmoidal artery. Patients will present with ophthalmoplegia, proptosis, and changes in pupil size. Patients with suspected intraorbital hematoma should be managed by removal of any nasal packing, administration of intravenous steroids and mannitol, and performance of lateral canthotomy and cantholysis of the lower lid. An urgent ophthalmology consult should be obtained. Mucosal grafts (with or without muscle or fascia, depending on the size of the dural defect) may be used to patch defects and repair CSF leaks; intermittent clear rhinorrhea is an indication for their use. Composite septal cartilage-mucosa grafts or conchal cartilage may be used to repair larger bony defects. Injuring the periosteal attachment of the trochlea may cause diplopia, but the diplopia may spontaneously resolve if the periosteum is reapproximated well. Neuralgias can occur with injury to the supraorbital and supratrochlear nerves, which can result from an incision that extends too far superiorly and laterally. Damage to the optic nerve, artery, vein, or extraocular muscles can occur, but these happen less often with the external approach because of generous exposure. Other complications include facial deformity or concavity, synechiae to the septum, stenosis of the sphenoid os, recurrence, anosmia, CSF leak, and meningitis, mucocele, and mucopyocele. Injury to the posterior table may cause a dural tear, meningitis, intracranial abscess, hemorrhage, or even frontal lobe trauma. Long-term complications include mucocele and pyocele. The complications of an osteoplastic flap procedure with frontal sinus obliteration include cerebral contusion, CSF leak, forehead neuralgia and/or numbness, recurrence or need for revision, and poor cosmetic appearance. Operating on a patient with a previous osteoplastic obliteration is difficult, because the frontal sinuses are difficult to view after the first operation. One group of investigators reported a total complication rate of 19%, including a 2.8% incidence of CSF leak, a 9% revision rate, and a 6% frontal headache rate. Failure or recurrence (usually marked by frontal pain) with this procedure may be due to incomplete occlusion of the frontonasal opening, incomplete removal of the sinus mucosa, or infection of the fat or obliterative substance. Persistent disease or mucosa in the frontal recess may lead to a mucocele. Intraoperative blood loss is high. Other disadvantages or complications include anesthesia or paresthesia in the distribution of the supraorbital and supratrochlear nerve. Long-term complications include mucocele and pyocele. A debate exists regarding the role and duration of frontal recess stent placement in the surgical treatment of acute and chronic frontal sinus disease. Many authors advocate the use of stents any time the frontal sinus ostium is surgically enlarged. Varieties of stents and sheeting have been studied for this purpose. These include silicone drainage catheters, rolled silicone sheeting, Foley catheters, and Dacron prostheses. Freeman and Blom reported the successful use of a double-ended, flanged silicone stent. The shape of the stent allowed controlled retention, making it easier for the surgeon to determine the duration of the stent placement. Typically, preventative stents are left in place for 1-8 weeks, and stents placed after correction of frontal outflow tract stenosis are left in place for 6-12 months. Experienced endoscopists have presented arguments for each of these time frames. No long-term data are available on stent placement in the setting of surgically treated acute frontal sinusitis. An additional subject of debate is the use of mitomycin C (MMC), an antifibrotic agent used to help prevent scarring in the frontal recess or in the frontal sinus outflow tract. A different study demonstrated an 86% patency rate with follow-up of up to 32 months, but the investigators used multiple applications of the drug. Clearly, no standard protocol for application has been developed, so the efficacy of MMC is still in question. In pediatric patients, surgery should be minimal and focused, because sinus surgery in the pediatric population can alter facial growth. Other concerns regarding these patients include the proximity of vital structures, bone fragility, and smaller anatomy, which makes avoiding stenosis of the nasofrontal duct more difficult. For recurrent disease, endoscopic approaches to the frontal sinus are preferred. External approaches are typically reserved for recurrent serious acute frontal sinusitis. Another study investigated a method for prediction of the clinical outcome of acute frontal sinusitis after trephination and found it to be highly effective. The technique used measurements of the nasofrontal duct. Rhinomanometry of the frontal recess was measured by means of a trephination drain. The patient breathed through a flow mask, and concurrent pressure changes inside the frontal sinus were recorded via the drain with a pressure channel that was connected to the drain by a short plastic tube. The ventilation test proved to be highly predictable if the ventilation was considered open (pressure changes during breathing and forced breathing >50% compared with the nasal airflow) or if it was totally obstructed (no pressure changes obtainable). This finding underlines the importance of the pathology of the frontal recess/infundibulum in causing acute and recurrent frontal sinusitis. Osteoplastic flap obliteration procedures have varying rates of complications (as high as 18%), depending on the substance used for obliteration and if a donor site is needed. A 30% recurrence rate has been noted for some external approaches. Analysis of short-term outcomes for endoscopic frontal sinus drill-out procedures in one study revealed a success rate of higher than 80%, along with a 12.5% failure rate. However, these results were tabulated for patients with a history of chronic sinusitis. Long-term outcome data for acute frontal sinus disease managed with endoscopic sinus surgery are minimal. Another study indicated that endoscopic surgery for frontal sinusitis was associated with a 25% improvement in the number of medications used and in overall improved general health. Hakim HE, Malik AC, Aronyk K, Ledi E, Bhargava R. The prevalence of intracranial complications in pediatric frontal sinusitis. Int J Pediatr Otorhinolaryngol. 2006 Aug. 70(8):1383-7. [Medline]. Lang EE, Curran AJ, Patil N, Walsh RM, Rawluk D, Walsh MA. Intracranial complications of acute frontal sinusitis. Clin Otolaryngol Allied Sci. 2001 Dec. 26(6):452-7. [Medline]. Parida PK, Surianarayanan G, Ganeshan S, Saxena SK. Pott's puffy tumor in pediatric age group: a retrospective study. Int J Pediatr Otorhinolaryngol. 2012 Sep. 76(9):1274-7. [Medline]. Stokken J, Gupta A, Krakovitz P, Anne S. Rhinosinusitis in children: a comparison of patients requiring surgery for acute complications versus chronic disease. Am J Otolaryngol. 2014 Sep-Oct. 35 (5):641-6. [Medline]. Tabaee A, Kamat A, Shrivastava R, Buchbinder D. Surgical management of pneumosinus dilatans frontalis in the setting of chronic rhinosinusitis and type III frontal Cell. J Craniofac Surg. 2012 Jan. 23(1):158-60. [Medline]. Loehrl TA, Toohill RJ, Smith TL. Use of computer-aided surgery for frontal sinus ventilation. Laryngoscope. 2000 Nov. 110 (11):1962-7. [Medline]. Mafee MF, Tran BH, Chapa AR. Imaging of rhinosinusitis and its complications: plain film, CT, and MRI. Clin Rev Allergy Immunol. 2006 Jun. 30 (3):165-86. [Medline]. Chiu AG. Frontal sinus surgery: its evolution, present standard of care, and recommendations for current use. Ann Otol Rhinol Laryngol Suppl. 2006 Sep. 196:13-9. [Medline]. Conger BT Jr, Illing E, Bush B, Woodworth BA. Management of Lateral Frontal Sinus Pathology in the Endoscopic Era. Otolaryngol Head Neck Surg. 2014 Apr 4. 151 (1):159-63. [Medline]. Hopkins C, Noon E, Roberts D. Balloon sinuplasty in acute frontal sinusitis. Rhinology. 2009 Dec. 47 (4):375-8. [Medline]. Hahn S, Palmer JN, Purkey MT, Kennedy DW, Chiu AG. Indications for external frontal sinus procedures for inflammatory sinus disease. Am J Rhinol Allergy. 2009 May-Jun. 23 (3):342-7. [Medline]. Anand VK, Hiltzik DH, Kacker A, Honrado C. Osteoplastic flap for frontal sinus obliteration in the era of image-guided endoscopic sinus surgery. Am J Rhinol. 2005 Jul-Aug. 19 (4):406-10. [Medline]. Weber R, Draf W, Keerl R, et al. Osteoplastic frontal sinus surgery with fat obliteration: technique and long-term results using magnetic resonance imaging in 82 operations. Laryngoscope. 2000 Jun. 110 (6):1037-44. [Medline]. Ochsner MC, DelGaudio JM. The place of the osteoplastic flap in the endoscopic era: indications and pitfalls. Laryngoscope. 2015 Apr. 125 (4):801-6. [Medline]. Leong SC. Minimally Invasive Surgery for Pott's Puffy Tumor: Is It Time for a Paradigm Shift in Managing a 250-Year-Old Problem?. Ann Otol Rhinol Laryngol. 2017 Jun. 126 (6):433-7. [Medline]. Gross WE, Gross CW, Becker D, Moore D, Phillips D. Modified transnasal endoscopic Lothrop procedure as an alternative to frontal sinus obliteration. Otolaryngol Head Neck Surg. 1995 Oct. 113(4):427-34. [Medline]. Knipe TA, Gandhi PD, Fleming JC, Chandra RK. Transblepharoplasty approach to sequestered disease of the lateral frontal sinus with ophthalmologic manifestations. Am J Rhinol. 2007 Jan-Feb. 21(1):100-4. [Medline]. Chan KO, Gervais M, Tsaparas Y, Genoway KA, Manarey C, Javer AR. Effectiveness of intraoperative mitomycin C in maintaining the patency of a frontal sinusotomy: a preliminary report of a double-blind randomized placebo-controlled trial. Am J Rhinol. 2006 May-Jun. 20(3):295-9. [Medline]. Amonoo-Kuofi K, Lund VJ, Andrews P, Howard DJ. The role of mitomycin C in surgery of the frontonasal recess: a prospective open pilot study. Am J Rhinol. 2006 Nov-Dec. 20(6):591-4. [Medline]. Wide K, Antila J, Sipilä J, Suonpää J, Parkkola R. Healing results of prolonged acute frontal sinusitis treated with endoscopic sinus surgery. Rhinology. 2002 Dec. 40(4):189-94. [Medline]. Sipilä J, Suonpaa J, Wide K, Silvoniemi P. Prediction of the clinical outcome of acute frontal sinusitis with ventilation measurement of the nasofrontal duct after trephination: a long-term follow-up study. Laryngoscope. 1996 Mar. 106(3 Pt 1):292-5. [Medline]. Wigand ME, Hosemann W. Am J Rhinol. Endoscopic surgery for frontal sinusitis and its complications. 1991. 5:85-9. Wide K, Suonpaa J, Laippala P. Clin Otolaryngol. Recurrent and prolonged frontal sinusitis. 2004. 29:59-65. (A) Incision under brow extending about 1 cm below the medial palpebral (canthal) ligament, (B) medial orbital wall entered with removal of posterior edge of nasal process of maxilla and lacrimal and anterior portions of lamina papyracea, (C) removal of posterior ethmoid cells, (D) superiorly based mucoperiosteal flaps lining of new frontal nasal communication, intranasal tube into frontal sinus. (A) Incision (above or below eyebrows), (B) superiorly based skin flap, with use of template of frontal sinus and a cut through periosteum along the superior, medial, and lateral edges, (C) saw blade of sagittal plane saw used to make a beveled cut through bone with inferior hinge of intact periosteum, with a line of fracture of bone-periosteum flap, (D) osteotome used along cut edges to elevate bone-periosteum flap, (E) flap reflected downward to expose sinus (in this case, osteoma is seen in the sinus; otherwise, in frontal sinus disease, all mucosa of sinus must be removed). (A) After obliteration, the flap is returned, and the periosteum reapproximated with absorbable suture, (B) outline of extension of brow incision in bilateral frontal sinus disease, (C) coronal incision in female patient to obviate brow incision.